The exploration into cuts of beef continues. Over the last couple weeks, I experimented with ribeye and flank steak. This week I turn to the relatively inexpensive New York strip steak (or simply, strip steak). The New York strip is a close relative to the T-bone steak… if you remove the piece of tenderloin and the bone from the T-bone steak, you’re left with the New York strip steak. I thought I would stick to a simple but classic preparation: steak au poivre. The steak is coated with salt and coarsely ground, and fried in a hot cast-iron pan. My steaks were not very thick, so I had to be careful not to overcook. While the steaks rested, I prepared a simple red wine reduction in the same cast-iron pan, incorporating any browned bits stuck to the pan. 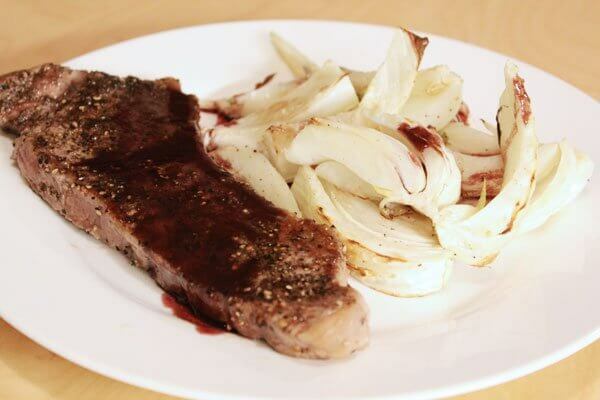 I served the steak with roasted fennel. Compared to the ribeye from last week, the ribeye is a more tender cut of meat. But for the price difference, I’d choose the New York strip for everyday meals. If you want to impress, grab the ribeye… but if you’re watching the budget, you’ll be just as happy with New York strip steak.